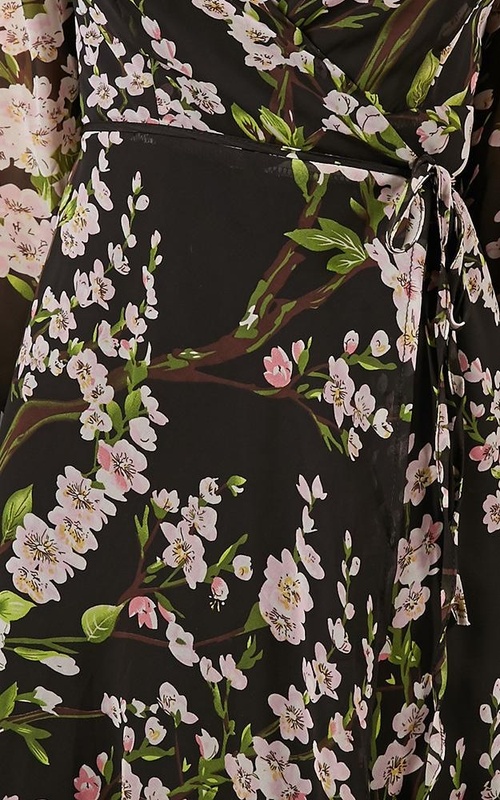 Fall into Autumn with this floaty floral chiffon maxi dress - the perfect transeasonal dress. The wrap detail means you can show as much or as little cleavage and leg as you want. To complete this look, pair this dress with strappy heels or sandals and a cute gold chain. Take this outfit from day to night. Filter By Height: Show All 5'6" 5'9"
This dress is grossly undersized. the fabric is beautiful, but it fits more like a duster jacket than a dress. I was really excited to get this dress for my birthday and when i tried it on I found threads coming out on both sleeves and the black slip on the bottom forms an upside down V in front to make sitting down impossible without flashing. So has to be worn with a slip of anything. Unfortunately can’t return because they don’t pay for return shipping which ends up being more than half what the dress cost. Super disappointing.